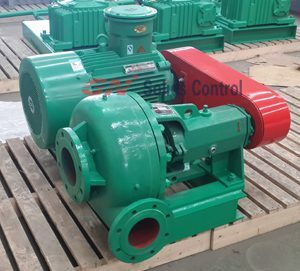 Shear pump contain following parts: impeller, vortex shell, transmission shaft, belt pulley, belts, motor and bearing. The impeller of the shear pump is totally different compare with other pumps due to its function, shearing the objects. The impeller which contain high cutting efficiency that have 5 structure parts: axial flow turbine, reservoir, wheel for pump, plenum chamber and cutting plates. The whole parts structure in stainless steel that has compact structure for it. The flow axial turbine is for fluid with displacement and for pump and the tank. The fluid flow through the pump wheel is discharged into the vortex shell, and the half of fluid is absorbed by reservoir. The fluid flowing through the pump wheel is parallel to the shear plate flow and has a high flow rate. The fluid mixed with the shear pump wheel in a higher flow rate, and the high speed rotation of the shear plate is serrated, and the fluid that contain solid is sheared. By this way of process, the fluid flowing through the impeller, subjected to multiple shear. The seal of the Shear pump with a very reliable mechanical and to make sure no leakage. The pump turbine is mounted on a specific base plate and is move by a belt pulley. A V belt in narrow design drive an IEC explosion proof certified motor, and a mixing hopper with a size suitable for use with the shear pump is composed of a completed shear and hydration system. 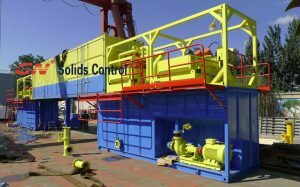 GN Solids America LLC’s JQB series shear pump with specific purpose of whole solids control system that can meet all system operators drilling fluid preparing for well drilling. It can makes the mud to obtain good rheological properties and reduce the cost of drilling as much as possible. Dewatering unit is also called flocculation unit, it means to flocculate the extra fine particles with the help of 2 or 3 chemicals into larger ones for further separation by the decanter centrifuge. In many regions and countries in the world, only a solid control system and a drilling waste management system are not enough to be a complete zero discharge closed loop without the help of the dewatering unit. Alongside the drilling rig systems, the dewatering unit is used for separating out the extra particles from the solids control system when the drilling mud in the solids control system has been used for several times and there are lot of extra fine particles smaller than 2 microns. In a mud plant or mud station especially for the dewatering project. In this case, the drilling mud is storage in some tanks waiting for being treated by a dewatering unit, but this place is not alongside the rig. Oil sludge project, in such project, the condition of mud is similar as above mentioned mud for the dewatering units, the sludge is of high viscosity and the solids particles are very small. So the operators need to add some chemicals to merge the particles into larger ones. This is a jobsite working video of GN mud mixing system in this case. In previous projects, GN dewatering units are also suitable for mud tank cleaning projects, with some auxiliary equipment and devices. In some countries, when the environment standard is high, some clients even use dewatering unit for TBM project. GN has some standard configuration of dewatering units, mostly ,the dewatering unit is installed in a 20 ft container and could be transported as a 20 ft container. And it is designed for 2 chemicals. According to clients’ customized request, there are more designs available. GN solids control Design and manufacture of container of combustible gas oilfield operations in the electronic déflagration system is the refinery along with gas gathering and switching exhaust and vent typically the gas processing plant, having fields of electronic combustion system can vent inflammable harmful gas ignited lose in order to eliminate its difficulties for environment and safety, is often a safe, environmental protection products. Besides used in refinery and also gas stations, oil field electric ignition device with mud gas separator, is now traditionally used in oil drilling executive. Digital ignition oil fields “artificial lighting” to “automatic operation”, reflect the humanistic thoughts and environmental demands. Making it necessary to use electronic combustion device, drilling, testing, development process, the release is often the truth. Over the past few decades, Flare feu are manual operation, persons close to flare points, can burn, burns easily, high risk; As well, the artificial operation timeframe is longer, the accuracy and reliability is not high, easy to produce toxic gas emissions for the atmosphere in great volumes, cause different degree of atmosphere pollution. GN SOLIDS CONTROL Production of electronic feu device let the “shortcomings” stopped to exist. It can be currently of relief, timely, exact location setting off export spewed toxic flammable gas movement line, eliminating the damage connected with gas pollution to the atmosphere and human and pet. Electronic ignition device besides used in refinery and filling stations, the device with mud propane separator, is now widely used inside petroleum drilling engineering, is actually a mature product, in home and sichuan oil and gas discipline in xinjiang, in spots like Iran, Egypt, venezuela abroad are using the product. Electric ignition device is mainly made from DN200 (or 6) gasoline burner (torch), GDH : type 2 electronic igniter, firing equipment (gas tank, hose, etc . ), mud gas separator (matching) whenever used in drilling engineering, and so on This product adopts high performance electronic digital ignition circuit, its principal parts adopt imported ingredients and other parts and cables and wires with domestic high quality goods, stable performance, reliable perform. Install the butano gas pipeline to safe practices of burner (torch) atmosphere inlet. Pick up and start the actual electronic igniter current transformation and voltage amplification routine. Open the gas tank, operating electronic igniter light source flash tube ignition (level), or directly open the particular emptying the firing on the gas valve, lit fireplace with electronic igniter pipe ignition (level 1). Wide open the gas vent gateway cut, lit by the using up fire tube will mélodie (secondary ignition). Close the actual gas tank, put out open fire tube, let the combustible in-take gas combustion. 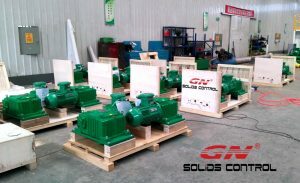 GN Solids Control sell a series of solids control equipment and drilling waste management equipment including vertical cuttings dryer , shale shaker , shear pump , oilfield shale shaker , mud cleaner , desander and desilter , vacuum degasser , Mud Gas Separator , decanter centrifuge , mud tank , mud agitator , etc . GN Solids Americal normally keep stock for GN main product and shale shaker , mud cleaner and decanter centrifuge always keep stock there to service local client . Mud agitator is widely used in mud cleaning systems. It is utilized in the mud tank as well as on the vessel to avoid the actual particles from settling straight down. Mud agitator is composed of some sort of motor, a gearbox, the particular shaft and impellers. This can be a very small equipment for drilling field. Normally, a drilling rig mud tank system should be equipment with a significant no . of agitators. The higher quality , of the tank sides, a lot more quality of the mud agitators. 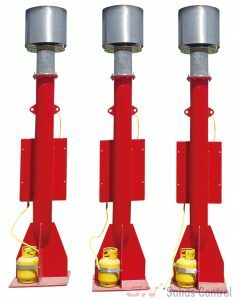 Many clients do not how to choose the best mud agitators modes and know the different mud agitators from different brand and various design. The main difference is that, typically the gearbox type is different. You will find mainly 2 type of items motor for mud agitators: helical bevel type items motor and Worm and kit type. The helical bevel type gear motoriswith 2-stage or 3-stage transmission period. It is with foot-mounted, flange-mounted Mounting mode, short flange-mounted model, torque arm-mounted type. Furthermore, the Output shaft ofthe helical bevel type accessory motoris solid shaft, ineffective shaft (with key, having shrink disc and with involute spline). It is Large modular design of the helical bevel type gear electric motor. The helical bevel variety gear motoris with High reloading support. It is with a secure transmitting and a low noise degree. The helical bevel variety gear motor is with good performance sealing. It can be used for an array of industry application. The helical bevel type gear generator is with a High efficiency. It will save power during operating. The helical bevel style gear motoris low repair and it can reduce the cost of users. Worm and gearmotor device agitators is one of the most popular kind mud agitator. The gear package is worm and gear kind for easy operation repairs and maintanance. The worm and gear package is utilize the gear in order to transmit the motor acceleration to the request RPM. It might be widely used. Welcome come to know more info from our sales team. April is a beautiful efforts Russia, especially in their investment city Moscow. The annually event for oil and gas market, including all related job areas including oil and gas drilling, olive oil refinery, drilling mud these recycling chemicals and equipments, also transportation equipments and options. As the leading manufacturer to get solids control and drilling waste management, GN Solids Control established office inside Moscow for 2 years, and it has been attending the Moscow Oil Show for many years. On a yearly basis, GN brought the newest type of equipments to the Russian customers and feedbacks are good. 1 . GNCD930D vertical cuttings dryer. GN firstly created the GNCD930 decanter centrifuge several years ago, now it is the fourth generation with the flushing atmosphere gun and other new improvements, it is used by many big companies worldwide, including Baker Hudges, along with etc . 2 . GNLW363CG decanter centrifuge, it has many purposes, like drilling waste management together with vertical cuttings dryer, for solids control, it could be used for barite healing period, or extra fine contaminants separation, or together with dewatering unit as dewatering centrifuge with chemical enhanced dust. 3. Mud Cleaner GNZJ594E-3S16N, it is a combination of shale shaker, desander cones and desilter cones, always positioned right after shale shaker. You can check the idea with all advantages of GN shale shaker, GN desander cones and desilter cones. GN has complete solids control and waste management series for oil and gas drilling, any turn key solution, with necessary equipments. If you need details, welcome to visit us at the necessary oil show, we have Russian talked sales to support you. Apart from, there are CIPPE in Next month in Beijing, Iran Olive oil Show in May with Tehran, and OTC with May in Houston that you see us.